Anna, the narrator of this riveting first novel, lives in a storybook world: exotic pre- World War II Shanghai, with handsome young parents, wealth, and comfort. Her father, the son of missionaries, leads a charmed and secretive life, though his greatest joy is sharing his beloved city with his only daughter. Yet when Anna and her mother flee Japanese-occupied Shanghai to return to California, he stays behind, believing his connections and a little bit of luck will keep him safe. Through Anna's memories and her father's journals we learn of his fall from charismatic millionaire to tortured prisoner, in a story of betrayal and reconciliation that spans two continents. 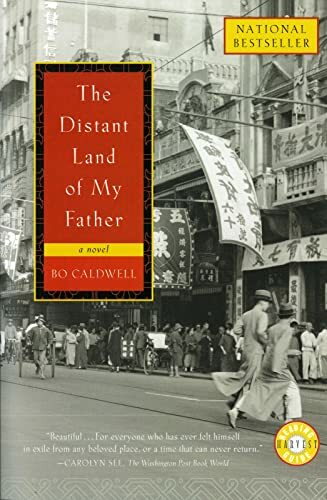 The Distant Land of My Father, a breathtaking and richly lyrical debut, unfolds to reveal an enduring family love through tragic circumstances. This was a wonderful story. It was difficult to read at times, but well worth it. I highly recommend it. This book is going into my Family Members VBB.